National Beverage Corp. Growth Accelerates─ On Track for Billion Dollar Revenues; $504 Million – First 6 Months | National Beverage Corp.
“National Beverage is creating operating performance that is astounding, and when a seasoned operator can innovate, develop and focus on all the variables necessary to achieve these results – it’s standing ovation! If Warren wrote what I did, not a soul would utter a squeak of criticism!” stated Chairman and CEO Nick A. Caporella. “As I previously stated and wrote relative to our strong sustained performance, I sincerely believe that our record second quarter and six-month results more than certify that my statements were accurate . 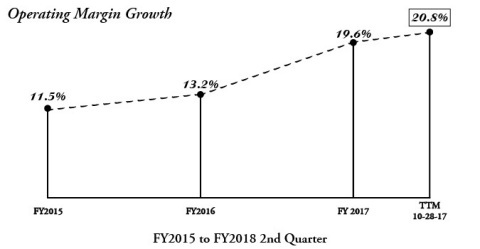 . . twelve consecutive quarters of revenue and earnings growth, the last ten of which include double-digit net income increases. Add to that, expanding operating margins, leadership of a consumer revolution and one of the industry’s strongest balance sheets, and you have the formula for impressive, dynamic momentum. LaCroix not only leads the category . . . but defines the category! Despite the introduction of competitive look-alikes, LaCroix remains the clear leader in packaging/shelf marketing, taste and consumer loyalty. With the increasing shelf presence of both LaCroix and our Shasta Sparking Water SDA (soft drink alternative), we are in a unique position to convert multiple generations to life-long consumers of our ‘healthy-hydration’ beverages. We are about to further the changing sparkling water protocols by introducing a revolutionary concept called ‘Shelf Demographics’. No other brand of refreshments has dared to organize the shelf set to cater to the changing ethnic preferences of the local population. These consumers will certainly love this new shelf set . . . created especially for them. Our brand performance and mid-year numbers post a clear signal of things to come; we are on course for another record year. Improving the health of America while rewarding shareholders with exceptional returns . . . it doesn’t get much better than this,” concluded a smiling Caporella. This press release includes forward-looking statements within the meaning of the Private Securities Litigation Reform Act of 1995. Forward-looking statements involve risks, uncertainties and other factors described in the Company's Securities and Exchange Commission filings which may cause actual results or achievements to differ from the results or achievements expressed or implied by such statements. The Company disclaims an obligation to update or announce revisions to any forward-looking statements. *Although the Company reports its financial results in accordance with accounting principles generally accepted in the United States ("GAAP"), management believes that the disclosure of EBITDA, a non-GAAP financial measure, may provide users with additional insights into the operating performance of the business. EBITDA (in millions) of $203.1 and $137.1 for the twelve months ended October 28, 2017 and October 29, 2016, respectively, is calculated by adding the following expenses back to Net Income: Depreciation and Amortization of $13.6 and $12.4; Net Interest (Income) of ($.8) and ($.2); and Provision for Income Taxes of $64.6 and $42.5.